dance.net - Gorgeous Modern 3-panel for Curvy Dancer (10245932) - Read article: Ballet, Jazz, Modern, Hip Hop, Tap, Irish, Disco, Twirling, Cheer: Photos, Chat, Games, Jobs, Events! Modern and Elegant modern dress. This velvet dress is in excellent condition. Loads of giant tear drop crystals that really sparkle on stage. Only worn a handful of times. Kept in smoke-free house. Includes patch on back. Dress worn at 2016 WRO. 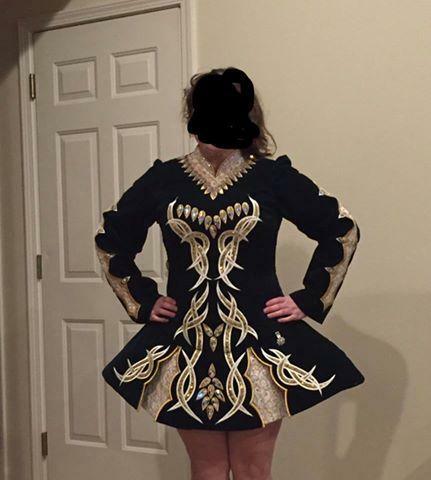 This dress is wonderfully made by Camille at All For A Jig. It is extremely light. No missing crystals. Gorgeous gold scroll detailing on panel. Perfect for any level. Dancer height 5 foot 3 inches.